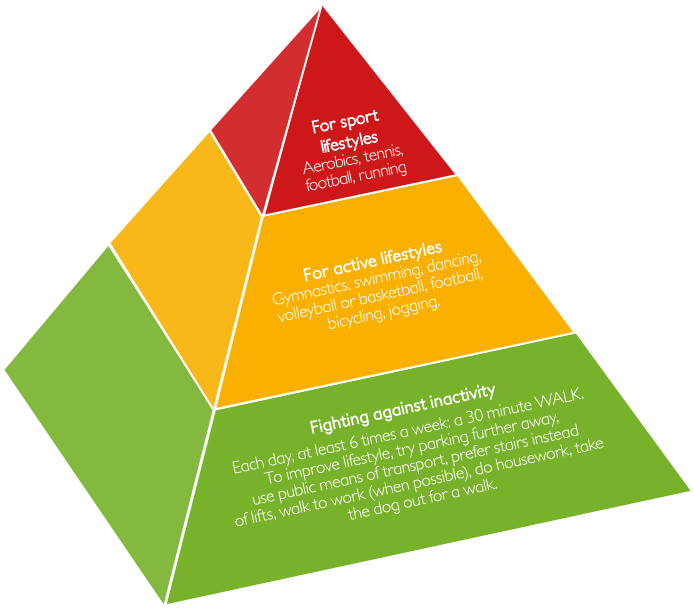 Correct lifestyle behaviours contribute to higher physical well-being. However, they require regular exercise and physical activity too. This is an important recommendation especially for populations with large food quantities at disposal and that tend however to have sedentary lifestyles. The energy imbalance, i.e. the positive balance between the energy absorbed from food and the one disposed of during physical activity, The balance between energy intake (absorbed from food) and energy expenditure (thanks to physical exercise) determines energy stores, which the main cause of obesity. Unhealthy lifestyles may consequently affect the risk of non-communicable diseases (obesity, metabolic and cardiovascular diseases, diabetes, etc.). The food pyramid is designed to make healthy eating easier. Nutritionists agree that healthy eating is about getting the correct amount of nutrients – protein, fat, carbohydrates, vitamins and minerals – you need to maintain good health. Foods that contain the same type of nutrients are here grouped together. The food pyramid gives you a choice of different foods from which to choose a healthy diet. The Sapienza University of Rome simplifies the organization of the right balance of nutritious foods, as it suggests the right portions of each food group. Vegetables provide water, minerals, vitamins, fibres and antioxidants. At least two servings per day are recommended. Fruit has a similar composition but contains more sugar. At least two or three servings per day are recommended. Bread, pasta, rice and tubers provide energy for vital body functions. 4 o 5 servings per day are recommended. Prefer extra virgin olive oil which has a rich content of unsaturated fats and vitamin E with antioxidant properties. Limit butter, full of saturated fats and avoid tropical fats (palm or coconut oil). Reduce to no more than 3 or 4 servings per day (a serving is equal to a tablespoon of oil or 10g of butter). Dairy products contain a host of nutrients like calcium, proteins and vitamins. The composition varies in different food. In particular, some types of chees have a high salt content. 2 or 3 servings per day (a serving corresponds to a 125ml glass of milk or a pot of yoghurt or 50g of ripened (aged) cheese. This food group provides proteins, vitamins, iron and other minerals, and is essential for a proper balance of all vital functions. Dietary guidelines recommend that we should not exceed 1 or 2 servings per day. Prefer white meat and do not exceed 4 or 5 servings per week. Three servings per week of cured meat (a serving is equal to 50 grams), avoiding products high in salt. Try to eat eggs, fish, crustaceans and molluscs twice a week (better if bluefish such as sardines, mackerel, anchovy, rich in omega-3). Eat legumes (beans, peas, chickpeas and lentils) twice a week too. The food at the top should be eaten sparingly and limited to special occasions. This group includes sweet deserts, chocolate, chips, sweet and salty snacks. Always avoid palm oil products (Food Times). This food should be avoided as it is high in fat, including saturated fat, sugar and salt. It provides calories but not important nutrients (like proteins) or micronutrients (minerals and vitamins). Regular physical activity is one of the most important things you can do for your health. It promotes good vital functions and helps to maintain a healthy weight and prevent some diseases. The simplest form of activity lies at the base of the pyramid, i.e. to walk quickly for at least 15 minutes per day. An hour of physical exercise, such as dancing, swimming, gymnastics Repeat 2 -4 times a week. Aerobics, tennis, football, running. Repeat once or twice a week.